Troy Downing is running for the Republican nomination to challenge Democrat Jon Tester for one of Montana’s seats in the US Senate. He is also responding to accusations that he illegally applied for resident hunting and fishing permits every year between 2011 and 2016—spiritedly. 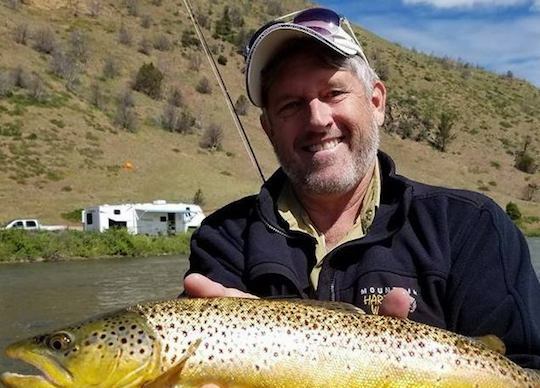 Last week, his campaign issued a statement saying that “It’s unfortunate the liberal Montana FWP deep state is on a witch hunt,” referring to the Department of Fish, Wildlife and Parks as an instrument of secret anti-conservative government. That was a stretch. Normally, a candidate would just cop to this kind of violation and kill the story. Downing can’t do that, though, because the essence of FWP’s allegations is that he doesn’t really live here. I would describe the evidence against him as comically substantial. According to FWP, Downing and his son Dylan used the same Montana driver’s license number to purchase resident hunting licenses within three minutes of each other. He filed Montana income taxes as a nonresident in 2013 and 2014. His property at the Yellowstone Club lists a San Diego post office box as its owner’s address. A 2013 profile in the Lone Peak Lookout describes him as a “part-time Yellowstone resident” who enjoys throwing grape-stomping parties at his vineyard in California. On his blog, he has written about returning from his vacation property in Montana to his home in California. And he is the CEO of a real-estate investment company based in San Diego. Nevertheless, Downing insists the charges against him are political. So far, though, his campaign has avoided saying he was a resident of Montana all those years. They’ve pulled out all the stops otherwise, repeatedly citing his veteran status and calling the judge in his case a Democrat who released records to sabotage his campaign. Actually, the Gallatin County attorney ordered those records released. You may remember him as the Republican who refused to release Greg Gianforte’s mug shot until a court ordered him to do so. The point is Troy Downing was framed. He’s a true resident of this state no matter where he quote-unquote “lives.” When you think about it, what’s more Montanan than using the money you made in California to buy a bunch of property here and run for public office? You can read all about it in this week’s column for the Missoula Independent, in which I look past the surface conspiracy of the Big Wildlife deep state to uncover something even deeper, darker, and dumber. We’ll be back tomorrow with Friday links, perhaps! The big historical misconception of the Gilded Age is that it was an age of great wealth, when really it was an age of widespread poverty. Between 1870 and 1900, growing industrialization and the sudden interconnection of markets by rail made a small number of American industrialists insanely rich. The Gilded Age produced the Rockefeller, Vanderbilt, and Carnegie fortunes. It also impoverished millions of ordinary Americans, who went from self-employment as small farmers and independent craftsmen to working in mills and on railroads—often for sprawling trusts, usually with little control over hours or conditions, and invariably for low wages in an economy driven by industrial-strength inflation. 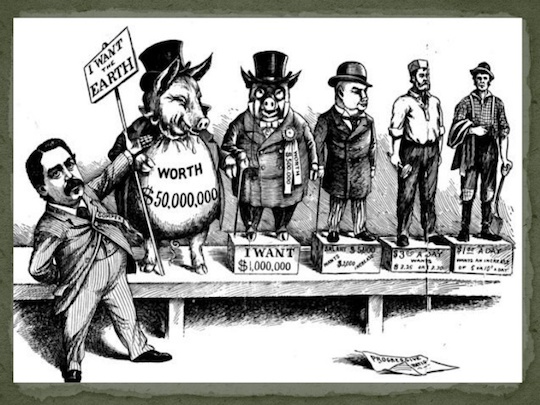 The Gilded Age made a few people rich at the expense of everyone else. It is named for the 1873 novel by Mark Twain, and the whole point of “gilded” is that the gold only covered the surface. Beneath it lay something base that the wealthy wanted to cover up. Anyway, I don’t know why I’m thinking about this in the 21st century, during our second industrial revolution. I guess I’m just savoring the fact that nothing like that could happen now. Today is Friday, and our age remains totally un-gilded. Won’t you insist that everything is fine with me? The future Senator Rock deserves your eager support for two critical reasons: First, it will drive the liberals insane. Second, it will make George Will and the rest of Team Fredocon soil themselves…“Kid Rock? Oh, well I never!” You simpering sissies. I’ll take his nasty stringy mop and torn wife beater over your preferred weasels’ coiffed politician/newscaster hair and Gucci loafers…No, he didn’t go to some Ivy League snob factory and all he’s got to rely on are attitude, common sense, and a love of actual Americans (especially our troops). When you say that, you’re mostly saying you don’t love various other Americans you do not regard as actual. Here lies the heart of 21st-century conservatism, palpitating. It is not a set of positive values. It is a critique, and an increasingly bitter one. The troops are innocent, but otherwise, the things Schlichter praises about K. Rock are all negations: not going to college, not wearing the clothes of the professional class, not being qualified for office and therefore angering people who think he should be. This was the appeal of President Trump, too. He may be a reckless liar who watches eight hours of TV every day, but he drives liberals insane! Driving liberals insane has been the primary function of the Republican Party since 2009. That’s what allowed the entertainment wing to achieve dominance over the political wing. 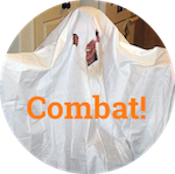 While actual Republican senators and congresspeople had an incentive to preserve some comity with their colleagues across the aisle, pundits and media personalities were free to define themselves by antagonism. This antagonism became the party’s sole principle. Who are the most significant figures the right has produced in the last ten years? Trump, Sarah Palin, Paul Ryan—maybe Bill O’Reilly. Most of them are entertainers. 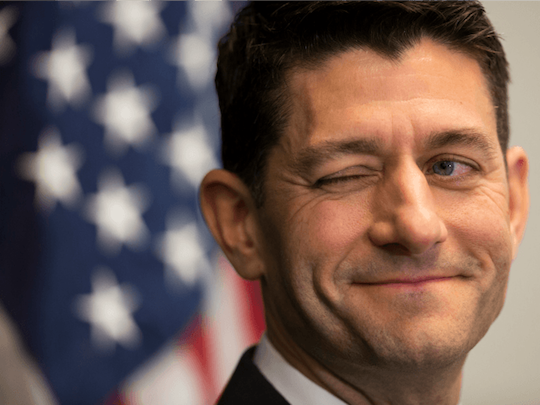 Ryan enjoys a reputation as a policy wonk, but he earned it by submitting austere budgets to a president who never threatened to pass them. To some degree, conservatism has always been a critique. The welfare state; regulation of trusts, consumer goods and capital markets; consolidation of power at the federal level instead of the states—all of these are features of modernity. Conservatism has historically balanced this critique with support for institutions, but contemporary Republicans despise institutions most of all. You can see it Schlichter’s contempt for the Ivy League—a “snob factory”—and George Will, the very symbol of institutional conservatism. You can see it in his swipe at newscasters and in the rhetorical war President Trump has waged on the press. Again, they love the army, but what other established institution would the conservative-entertainment complex not gleefully tear down? Schlichter is endorsing Kid Goddamn Rock for senate, essentially for the lulz. At what point must you admit that you are simply a nihilist? Nihilism is the wrong word, though, because the contemporary GOP is vehemently ideological. They believe fervently in supply-side economics, even though it has never worked. They reject scientific consensus on global warming and evolution, harnessing a belief that is stronger than facts. They seem obsessed with rooting out RINOs in their midst. Overall, today’s Republican Party seems to believe much harder than the Democrats. It’s just that their core belief is most things are bad. They’re like ISIS or the Amish: committed to a totalizing critique, not just of other ideologies but of the world. Maybe that’s why they haven’t been able to get anything done now that they’re in power. Twenty-first century conservatism is a robust system for rejecting things, including the imagined cultures of America in general and Washington in particular. But it does not put forth an affirmative vision of the future. 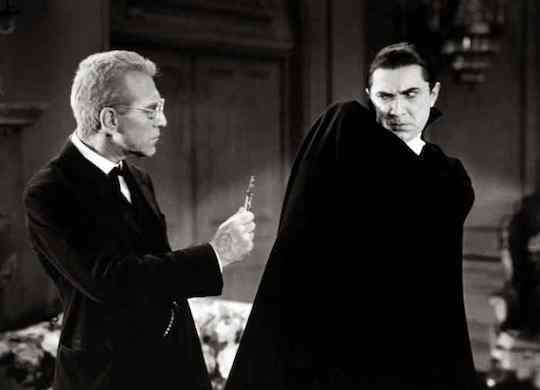 They want to repeal, figuratively speaking, but they cannot replace. Schlichter loves Kid Rock because he would freak out the liberals, but he does not say how that would help. His party has a powerful strategy to win the war. It has been a long time since it has thought about how it might win the peace. “Make sure to emphasize that Obamacare is the real failure,” he told his staffers. 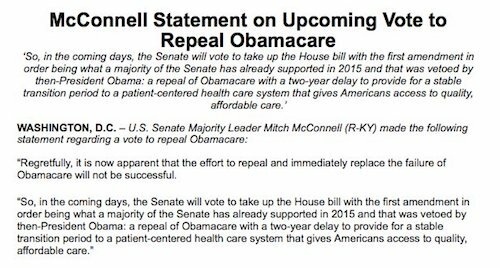 Also note the appearance of the word “immediately” in the established phrase “repeal and replace,” like a guest star who comes on in the last episode of a long-running drama to take the fall. So we failed to replace Obamacare immediately. We’re still going to replace it. What do you say we just repeal it now and replace it later? Fortunately, the New York Times reports that plan dead on arrival. The same Republican senators who did not want to take health insurance from millions and give them savings accounts also did not want to take health insurance from millions and give them a timeline. For now, at least, the effort to repeal Obamacare has failed decisively—even though Republicans control both houses of Congress and the executive branch when “Watters’ World” isn’t on. The GOP has drifted so far to the right on issues of social welfare as to lose the moderate members of its caucus. The bill under consideration was so particularly bad for women that these three women objected. Contemporary Republican politics is vigorous as a critique of liberalism but morbid as an approach to governance. Guess which explanation I favor. The Republican lifestyle brand as we know it today was forged in opposition to Barack Obama. He was the smooth-talking biracial latte drinker atop the pyramid of liberal power, and they were the Real Americans who said no. Over the last nine years, the outlines of this coalition have become remarkably clear. You can guess whether someone votes Republican by their car, their facial hair, their music and TV habits, their religion—any number of cultural signifiers. This cultural coalition is the one that propelled Donald Trump to the White House, but it is not a coalition of political interests. Once you have to start making concrete policy choices, the Republican coalition falls apart. How many interests do a West Virginia coal miner and a Chicagoland hedge fund manager have in common? What health care policy goals does Peter Thiel share with Ted Cruz’s dad? 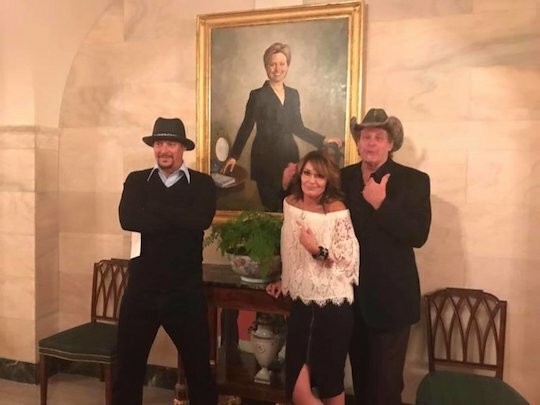 All four of these people are likely to agree on the issue of President Obama, but it’s harder to think of what else might bring them together. Right now, the GOP base consists of whites with high school diplomas, the investor/rentier class, evangelical Christians and libertarian idealists. A parliamentary system would put these demographics in at least three different parties. The contemporary Republican coalition has brought them all together, but it is not well suited to governance, because it is not an alignment of natural political interests. It’s a great way to get a bunch of people all watching the same TV network or voting against the same lady. But it has yet to be fully tested as a machine for solving the country’s problems or even passing substantive legislation. After nine years of tenacious opposition, the need to cooperate may be what finally shakes the modern GOP apart.